Yes, I have made more scones. I tell you I have fallen in love with scones. My daughter Krista is perfectly okay with this, she loves scones maybe even more than I do. 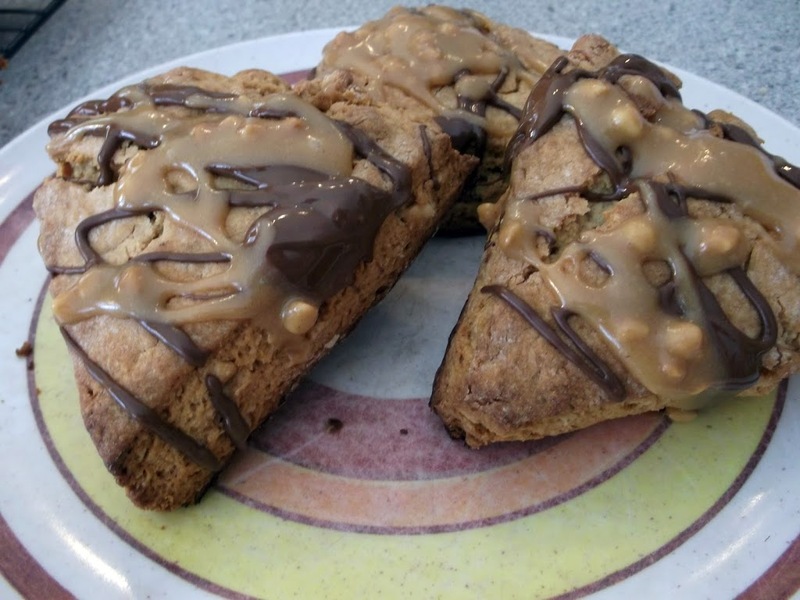 It was Krista who had requested peanut butter scones a while ago. She is also a big fan of peanut butter, which I love peanut butter as well. 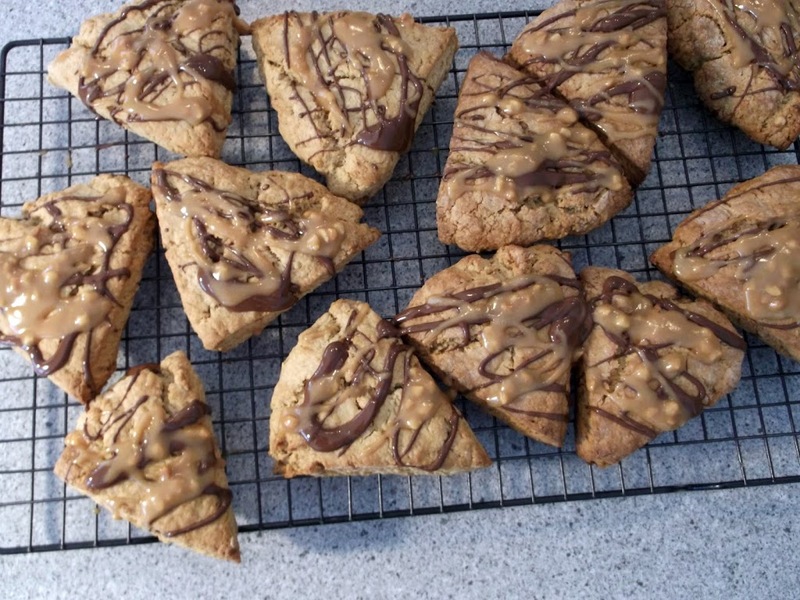 So I was fine with making a recipe of scones that included peanut butter. I actually didn’t find a recipe that really appealed to me, so I combined several recipes to make one that sounded good. I decided to add a little topping to the scones, if you look at my past recipes for scones I usually add a little glaze for a little more flavor. My family is into frosting, I guess they like the sweetness that it adds. These scones are a little on the dryer side. I thought maybe a little too dry, but Krista informed me that is how she likes her scones and she found nothing wrong with them. 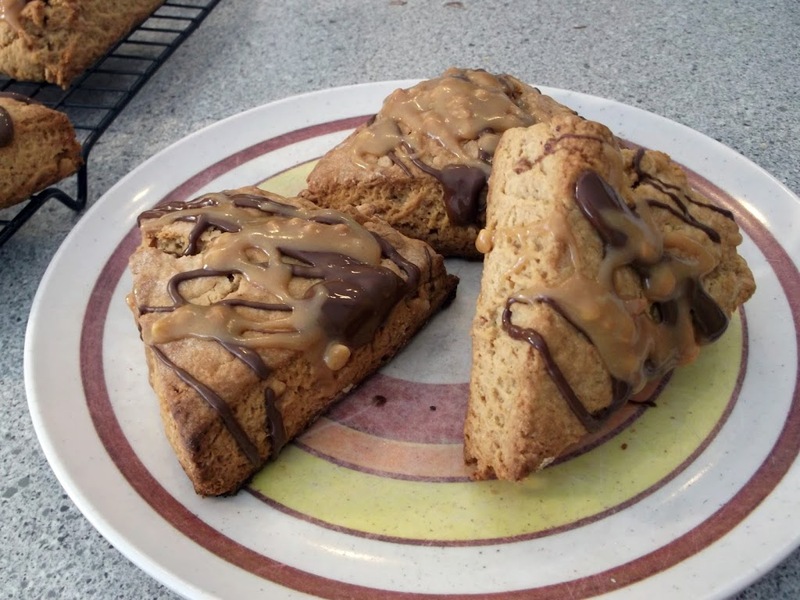 So if you like peanut butter scones I hope you try these. If you don’t like icing on your scones feel free to omit the icing, it will be okay with me. Preheat oven to 425 degrees F. Lightly grease baking pan. Mix together flour, brown sugar, baking powder, baking soda, and salt in mixing bowl. Cut in butter and peanut butter until mixture there is no pieces of butter larger than a pea. Add the egg and milk, mix well until it makes a soft dough. Divide the dough into 2 balls. Pat each ball into 3/4 inch thick circles, cut each circle into 6 wedges. Bake in preheated oven for 12-15 minutes. Let cool on racks. About 2 tablespoons peanut butter (warm in microwave until the peanut butter gets a little runny). Melt about 1/4 cup of milk chocolate chips with a about a 1/2 teaspoon of shortening. Perfectly shaped and drizzled! These sound wonderful! These scones look seriously delicious! Happy St. Patrick’s Day! Substituted mayo for eggs because I didn’t have any. Added mini chocolate chips omitted chocolate glaze. I like a dryer more crumbly scone and this is my favorite recipe yet! They were delicious and husband and two little ones loved them. I am going to try omitting the peanut butter glaze because it was a little too sweet. Also, I am going to try to make it with sesame tahini and make it a peanut free gluten free version for a friend. This is a recipe I will make over and over again and share with friends and family. Thank you so much for posting this recipe!!! chocolate and peanut butter glazes. I hope you will stop by again soon!